Hi Everyone - Please read the latest update from MPI regarding Q Fever validation. I am still waiting on DAWR and EMAI to respond to my questions relating to the possibility of not obtaining the required + / - results through the Pilot Program and what rammifications this could have. The next Export Quarantine from New Zealand to Europe will commence on the 24th of October with an intended export date of the 5th of December. Please could you contact us on either s.ridout@bigpond.com or mobile 61 414 719 566 to reserve your space. All Alpacas are to be at the Isolation facility by the 24th of October ready for inspection and drenching prior to entry. Please read this PDF document for a new update on exports from Australia to Europe. Update 11th of January, 2018. The Ministry for Primary Industry NZ will be revoking their Importing Health Standards (IHS) for Alpaca shortly, this will affect all Alpaca Imports into New Zealand. The issue relates to the required Q Fever testing methodology and the subsequent irregular results being returned. The decision is the result of the only 2 available tests being reviewed and assessed to be of unknown sensitivity in alpacas (the ELISA) and unacceptably low sensitivity (the CFT). An alternative, acceptable test has not yet been found. It was reported in the media earlier this year that the protocol for Alpaca to Korea was in place, in fact that is not the case however we are working behind the scenes to ratify the import requirements with DAFF. We will announce when this has taken place and the market is officially open for trade. As the chair of the Export and Trade Facilitation Group of the AAA, Steve has been working hard over the last 6mths establishing these protocols. It will benefit all alpaca breeders wishing to market themselves overseas. For further information please contact Steve on 07 4098 8451 or 0414 719 566. Wildflower Quarantine Station now Up and Running for all your Pre-Export Quarantine requirements. Wildflower Alpacas is owned and operated by Sue and Steve Ridout, both of whom have an extensive knowledge of the Alpaca Industry. Collectively, we have 20 years of experience breeding Huacaya Alpacas, with great success in both Victoria and Western Australia. On our farm, we take pride in maintaining the highest standards of cleanliness in our facilities, and we keep organised, up-to-date health and breeding records. We are actively participating in the Q Alpaca program, with Q and non-assessed paddocks available. 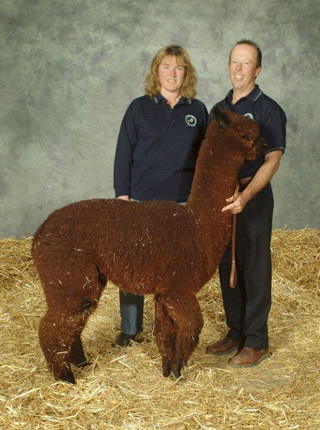 For those who are considering investing in Alpacas, getting to know the breeder and their animals is a must. We welcome you to visit our farm online and in person, become acquainted with our friendly Cria and even take an Alpaca for a walk. Steve has been active in both states through Show committees in WA, and as past President of the Western Region of Vic, including board member of the AA Co-operative. Please take your time wandering through our site and feel free to contact us at any time for information on any of the areas that are of interest to you. © 2017 Wildflower Alpacas. All rights reserved. Web Design and Hosting by Atomic Design Studio Pty Ltd.